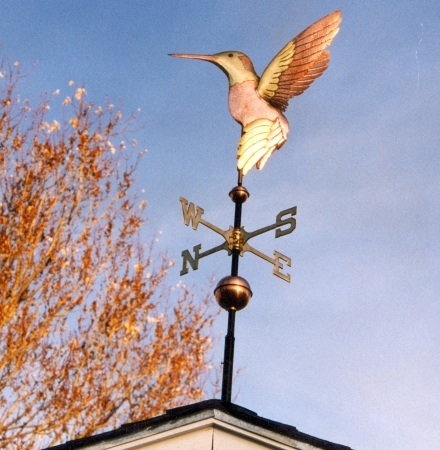 This Ruby Throated Hummingbird Weathervane is an early design that works beautifully in many situations. It works in a garden bed and it works atop a roof. 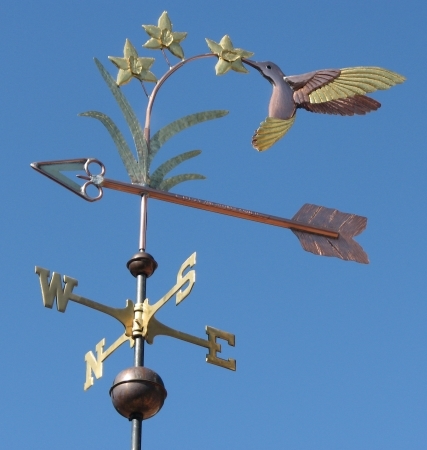 It also has a slim profile making it a good choice for windy locations. As pictured this Ruby Throated Hummer is fabricated of brass and copper, with special tooling creating the texture of feathers. Their is optional gold leaf on the beak and flower petals, and the bird has glass eyes. These details of eye color, metal choices, and optional gilding are all made at the time you place your order and your project goes into our work schedule. At that time you would also decide if you wish to have ‘Lucky Pennies’ sealed into your sculpture piece. 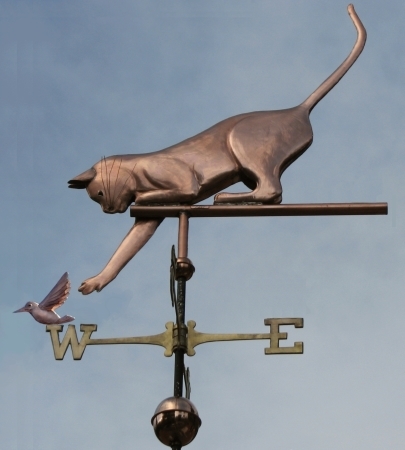 Every weathervane is made to order at West Coast Weather Vanes! Hummingbirds are small birds in the family Trochilidae. They are known for their ability to hover in mid-air by rapidly flapping their wings, 15 to 80 times per second (depending on the species). The Giant Hummingbird’s wings beat 8-10 beats per second, the medium sized hummingbird’s wings beat about 20-25 beats per second and the smallest beat 70 beats per second. Capable of sustained hovering, the hummingbird has the ability to fly deliberately backwards or vertically, and to maintain position while drinking from flower blossoms. They are named for the characteristic hum made by their wings.